Apple Cider Vinegar for Spider Veins: How to Use It? Spider veins are blue and red veins that appear on your skin, especially on your legs. Often you have to use concealer to hide these veins. If you are wondering how to get rid of them, this article will help you. Varicose or spider veins are swollen and often twisted veins that are visible under the surface of the skin. This can be seen in people of all age groups. Veins are valves, which make sure that he blood flow in only one direction upwards. When the blood flows from your legs to the heart, the valves prevent the blood from flowing backwards. It is important for the proper functioning of your body. As we have mentioned earlier, veins are valves that ensure upward flowing of the blood from the legs to the heart. When these tiny valves are damaged partially or fully, veins start showing their presence. In some cases valves may not be present in the veins. This can also led to the appearance of spider veins. When the valves are absent, the blood will not flow upward to the heart. Instead, it starts accumulating in the veins. This causes the veins to swell. If you sit or stand for long time, the swelling can increase. 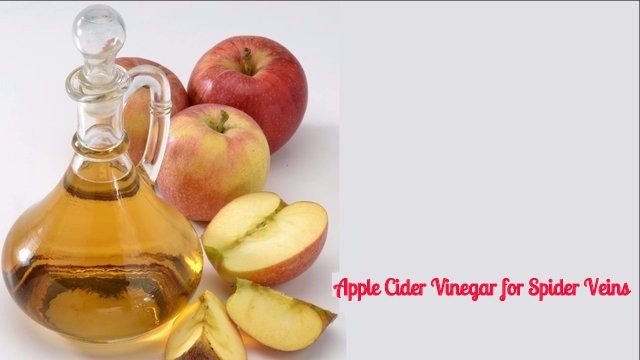 Apple cider vinegar is very effective for treating spider veins. Here is how you can use it to treat spider veins. Take the medical cloth or cheesecloth and soak it in apple cider vinegar solution. Now secure this cloth around the lower legs or the thigh. Let it remain on your leg for about 30 minutes and then you can remove the bandage slowly. Rinse your legs with plain water. Apple cider vinegar is acidic in nature. So, it is better that you carry on a little test before you apply it directly on your skin for the treatment of spider veins. If you have sensitive skin, you should surely do the test because you may develop a rash if you use it on your skin. If you do not get any irritation on your skin or develop any rash, then you can use it for treating varicose veins. If you want to get better results with this treatment, you may lie down on a flat surface and then put some pillows under the ankles. This way you can make sure that the blood does not flow downwards. In addition to this method, there are some other ways also to treat spider veins with apple cider vinegar. You can take aloe vera, carrot and apple cider vinegar and mix them well to make a homemade cream. Apply this cream on the spider veins. Massage it on your skin for some minutes and wait for about half an hour. Now wash it off with warm water. If your skin does not show any negative reaction towards apple cider vinegar, then you can apply it directly on the affected areas of your skin. You will have to supplement the direct application of apple cider vinegar with internal consumption. Drink two to three tablespoons of apple cider vinegar twice daily. If you do not like its taste, you can dilute it with water. Drink it just before you have your meals. You may also add a teaspoon o honey to apple cider vinegar and waetr4 mixture to improve the taste. With regular topical application and internal consumption of apple cider vinegar you can get rid of the inflammation of the veins caused as a result of the accumulation of blood. The result you get may vary depending on the extent of damage done. However, you will get significant difference within a few weeks. The general vinegar that you use for cooking is usually not very effective for treating spider veins. So, it is important that you buy pure apple cider vinegar from the chemist store. The product you use should be unfiltered and unpasteurized. This is because only such types of vinegar contain the mother of the vinegar – a muddy substance that is enriched with nutrients and enzymes. The best option is to buy a bottle of organic vinegar of a good and reliable brand. Remember to check the labels to make sure that it is unfiltered and unpasteurized. So, apple cider vinegar is great for treating spider veins in a natural way. Buy it today itself and say goodbye to spider veins! Garlic – eating one garlic clove everyday is a good way to treat varicose veins. Peel it, crush it with hand, and swallow it with water. Cayenne pepper – Take one cup of warm water and mix one teaspoon of cayenne pepper in it. Drink it twice or thrice a day. This can improve the blood flow in your legs and provide you relief from spider veins. Have it for 15 to 20 days. You will see the difference it brings. After that you can have it once a day. Cod liver oil and honey – Mix cod liver oil with honey and apply it to a bandage. You can tie this bandage to your legs and leave it on your legs overnight. The mixture helps in reducing the swelling. Make sure that you exercise regularly and massage your legs to prevent varicose veins. It is also important that you avoid sitting or standing for a long time. Reducing salt content, eating lentils, vegetables and fruits, drinking lots of water, wearing compressive stockings and controlling weight are some other ways to prevent varicose veins.